Welcome to the Historic Leather District! In the last decade, this nine-block area of downtown commercial buildings once cut off by the rest of the city by the Central Artery, has become one of Boston’s most chic neighborhoods. The Leather District, nestled between South Station on the East; Chinatown on the West; and the Financial District on the North, received its name because it was once home to a thriving shoe business and leather industry. Beginning in the late 1980’s, developers have purchased and renovated many of the old, massive warehouses into commercial and residential lofts, turning this former industrial section tucked between Chinatown and South Station into a full-fledged neighborhood complete with quaint cafes, busy restaurants and numerous contemporary art galleries. The loft concept has been very popular with residents who want to be close to their offices, artists who want large studio space, and transplanted New Yorkers who feel right at home in the Lower Manhattan-style atmosphere. 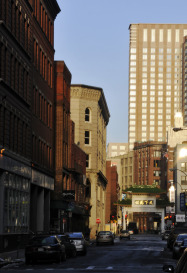 Due to its distinct personality, the Leather District has become one of Boston’s most sought after neighborhoods to live.